It was a chilly morning May 19th, but the rain was saying 20%. Fingers crossed it would be a dry one. This year I planned to park near the end, as last year I got an extra couple miles in post finish line. As a blister and tight calf victim, this is never fun after the finish. 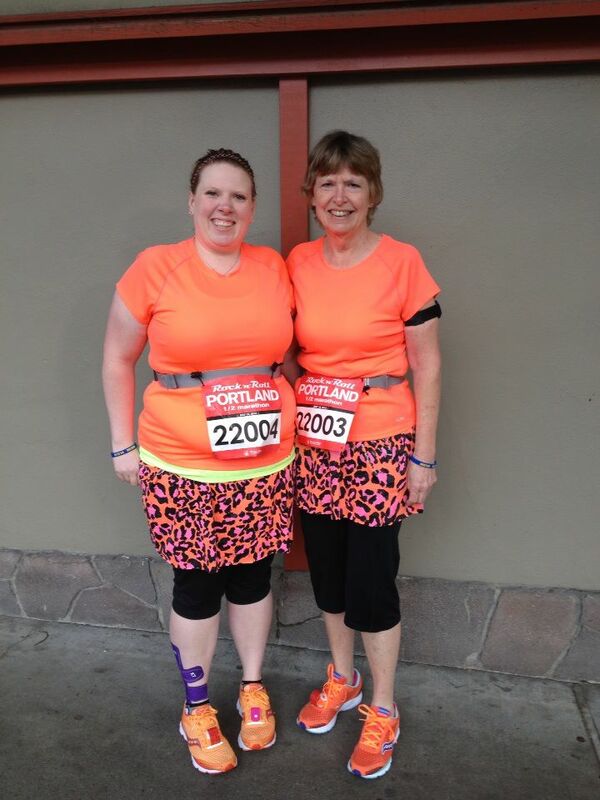 My mom, Suzie (my personal trainer), and I took some photos of ourselves to capture the neon glory we were sporting. We walked our way to the start line, to find that this year they were keeping the corrals closed to closer to race start. So, we had some time to people watch, glare at the sky when it tried to sprinkle on us. Not this year Portland!! Keep your rain drops up there!! We also become the official photographers favorite, “Can I take your photo?.” we had at least six taken before the race started. What can I say the running skirts I sewed last night were TOTALLY worth it! Made the last minute porta-potty run, and hike to Coral 22, it was time to go. Okaaay so that’s what the people in corral #1 think, but us in Coral 22 we spend about 30min slowly inching our way to the front. This year the route was changed, so we had the dreaded Naito Parkway out and back. It’s boring, depressing, dreary, and there is nothing like thinking wee mile three DONE! As the winner comes cruising in the other side…wind taken out sails momentarily. One the things I do love about this race is the music, just when you’re kinda feeling ho hum, slowing your pace, it boosts you along. Although the bands that kick into a slam jam, ballad song really do chap my hide. REALLY?! Now I know I’m slower it doesn’t mean I need a funeral march playing for me! We wove through Portland dry, climbed up the long reaching hill of Hawthorne and had a blast the entire time. There is a highly flattering montage a race photog took of me jamming to a reggae band at a stop light. I had a 9 mile slump, that had the pain in my feet making me question my sanity for about a mile. Mom and Suzie just kept pepping me back up, and we bantered our way back to a good place. Next thing you know I was recognizing the last few miles of the course and the adrenaline was going. In the last half mile the music is blaring and it’s time to run like a Kenyan for the finish line. Great day to finish another 13.1 and complete marathon weekend. We took part in the bananas, water, bagels, Michalob Lite beer, and FREE WHEATIES!! Benefit of being towards the end the vendors not wanting to pack home lots of extras. Wheaties happens to be my brother’s favorite cereal! 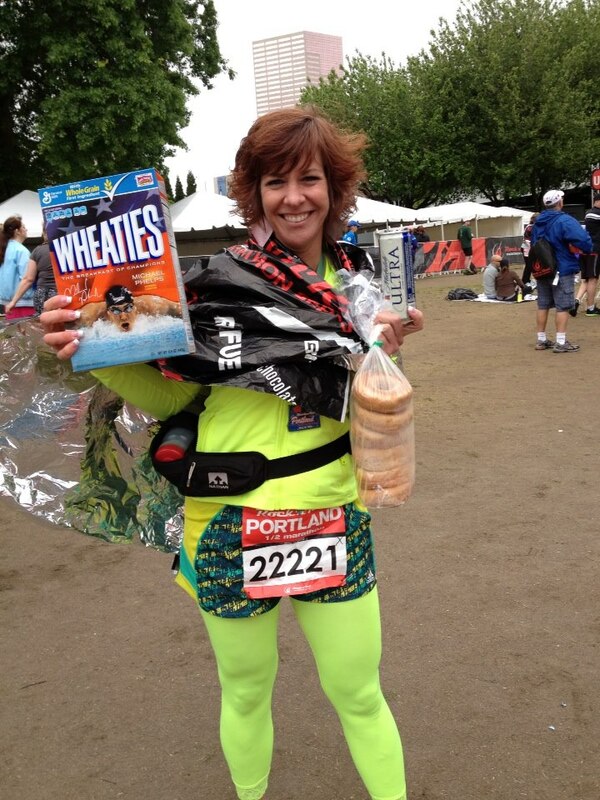 Suzie celebrating with PLENTY of CARBS!! Will I do it again? YES! 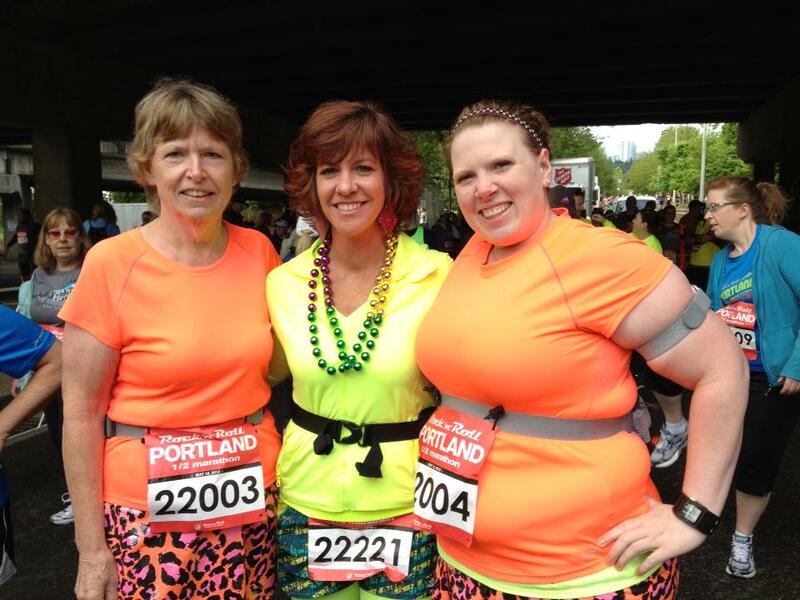 Signed up for 2014 at the expo, with my neon bells on!